The Digital Inclusion Alliance Aotearoa (DIAA) has three initial digital inclusion programmes: Stepping UP, Spark Jump and DORA. All these programmes are delivered in partnership with local organisations nationwide, principally libraries. The Alliance’s largest digital inclusion programme is Stepping UP, free community-based training that builds your digital skills and knowledge in small easy steps, in subjects that interest you for your life or work. Each self-paced module takes two hours, in a relaxed and sociable space, with a friendly tutor there to help. You can choose from over 30 modules, available in 93 libraries, REAPs and community centres nationwide. Stepping UP was established in 2009 with support from Microsoft’s Unlimited Potential programme. From 2012 to 2018, the programme was supported by the Ministry of Education and the Lottery Grants Board for Computers in Homes families and their local communities, as an opportunity to continue their digital learning journeys. From 1 August 2018, DIAA took over responsibility for managing and expanding the reach of the programme in collaboration with public libraries and community centres. The 2017-2018 Stepping UP report includes a wealth of information on the programme’s outcomes and impact over the last year. Spark Jump is a Spark Foundation programme that helps families get home broadband so their children can continue learning out of school hours. It’s the perfect solution if you need a low-cost, pre-pay internet service for your family and your children under 18, and you have no current broadband connection. Spark Foundation partners with community-based organisations like the Digital Inclusion Alliance Aotearoa to deliver wireless broadband to families without internet. In Spark Jump set-up workshops, you’ll set up your free modem so that it’s tried and tested ready for you to take home and use. Workshops or 1-1 sessions are available from 93 libraries, community centres and other partners nationwide. Spark Jump is closely associated with Stepping UP, with many Stepping UP partners running Spark Jump set up sessions and shares the same coordination and support staff. 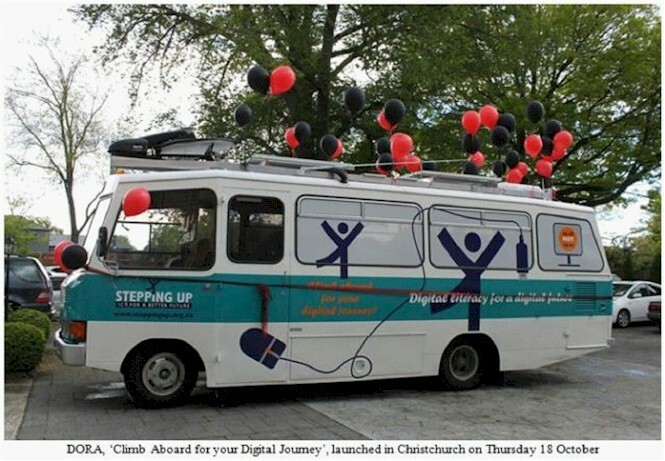 DORA is a 33-year old school bus from Central Otago that was converted into a high tech digital learning centre for the Stepping UP training programme in 2012. From 1 August 2018, responsibility for managing DORA transferred to DIAA. Up to 15 people can go on board at any one time for computer and internet training. DORA comes equipped with 10 laptops as well as satellite, 4G and 3G internet connections. The roof is packed with solar panels to supply power for the bus and when the sun isn’t shining, there is a petrol-driven generator to keep everything working. DORA also becomes a mobile wifi hotspot when her 12-metre mast is extended. 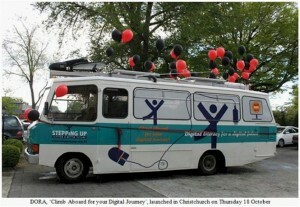 DORA is a completely self-contained digital classroom that can travel anywhere in New Zealand to provide computer and internet training for local communities. Where it is difficult for people to get to training centres DORA is the perfect solution – if people can’t get to training sessions, we are now able to take the training to them and park up in their street.